I’m sitting on the front deck of our house which sits on a small rise above Rainbow Lake. It’s late September in the North Country of New York State. The trees are oddly out-of-tune with the season. Some are brown, dead and waiting to drop to the ground. Some are just hinting at the blast of hues they will splash your color receptors with–in a few short weeks. And, some trees have ignored the short daylight and the 41 degree evening temperatures. They are holding their chlorophyll until some command from the Horai and, they too will reveal their true colors. I’m sitting on the front deck, breathing through my mouth and trying not to cough. I am just getting over a mild case of pneumonia that I seemed to have picked up while traveling to my high school reunion. My chest is feeling clearer and my temperature is roughly normal. I’m sitting here wearing a fleece vest–but that’s nothing new. I just took it off three months ago after wearing it pretty much since this time last year. But I’m not doing nothing. I’m watching a leaf dance. It’s movement caught the corner of my eye as I took out a bag of recyclables. A tiny maple leaf, part brown, part red and patched with black is caught at the end of a long strand of spider web that reaches from the roof to within a few inches of the floor boards. Don’t even try to see the gossamer thread, its invisible as far as I’m concerned. 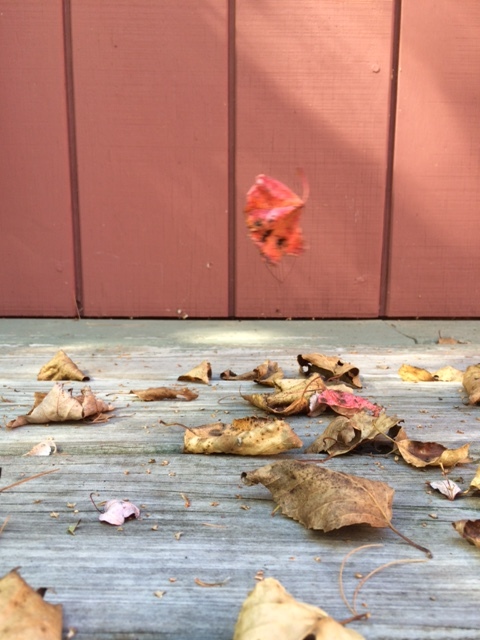 For me, the leaf is dancing its gentle pirouettes on the air. That’s why I’m sitting on my front deck. I’d be napping if I had not seen the leaf and I would be missing this special private recital. Just now, I hear a skein of Canadian Geese flying westward. Their honking has interrupted my silent concert. It has led me to think of the passing summer–and the approach of the cruel and harsh months of ice and cold. Winter usually begins without warning. In the Adirondacks, it could come on the next cloud–it all depends on your elevation. Here, beside the lake, it comes with seeing the first snowflake. Usually heavy with moisture, the first flakes are soft, pure and slow to reach the ground. Unless you find pleasure in winter sport, it’s a rough road until the Big Melt. But, soon, if a strong wind doesn’t take my leaf away, a snowflake or two will collide with the leaf and adhere to its surface. Then another will join–and then another. 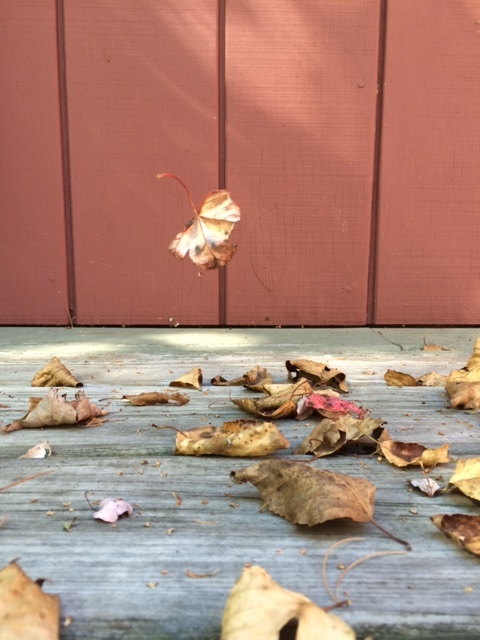 The weight will cause my leaf to break its attachment to the thread and fall to the deck. It’ll get swept away by new winds and then rot into the soil, under inches of snow, in our yard. I have to go inside for a box of tissues now. I wonder if the leaf will wait for me? I doubt it. The leaf owes me nothing. This entry was posted in Blogging, Everyday Events, Home, Melancholy Thoughts, Mountains and Memories, Nature, non-fiction, North Country Life, Objects of Beauty, Real Personal History and tagged Adirondacks, autumn, change of seasons, leaves, north country, snow, spider webs, winter.